Gruber Exhibit Opens at Washington County's Rural Heritage Museum! (Mercersburg, PA. June 15, 2016 – The Gruber Almanack, LLC is proud to announce that its founder, John Gruber, colonial printer, was honored with a special exhibition at The Washington County Rural Heritage Museum located in Boonsboro, Maryland. The exhibit chronicles Gruber’s life and times and is enhanced with a dramatic display of his substantial body of work that included his 220-year old Hagerstown Town and Country Almanack. 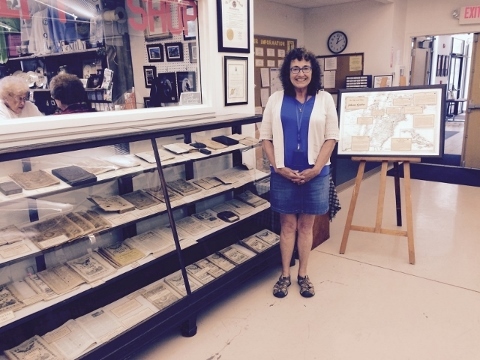 The exhibit, which opened on Saturday June 11th , was the creation of Martha Bowen, Curator of the Rural Heritage Museum, who first learned of Gruber through his almanacs and quickly became fascinated by his story and many accomplishments. Her desire for authenticity drove her to seek out special elements for the exhibit most notably from The Washington County Historical Society of Hagerstown, Maryland, its own members, as well as from the Gruber Almanack, LLC partners Jerry Spessard, Bill O’Toole, and Chad Fisher. They not only provided additional background to the Gruber story but also lent the museum a number of rare artifacts from their own collection to enhance the exhibit (the original wooden print blocks of the front and back covers of the 1797 edition as well as several rare copies of past editions, in both German and English languages). Washington County, Maryland's Rural Heritage Museum Curator, Martha Bowen stands proudly in front of her special exhibit recognizing colonial printer, John Gruber for his many accomplishments and for his influence on rural life in the Mid-Atlantic Region through his famous publication, the 222-year old Hagerstown Town and Country Almanack.